The egg plant or aubergine is a member of the potato family, related to tomato, sweet pepper, chilli pepper and cape gooseberry. It has the typical potato family flowers, purple in colour and flat, star-shaped with a central pointed yellow pistil. Unlike the other potato family crops, the aubergine originated in India, where wild types are still found. Other species occur in various parts of the Far East and are used for food, for instance, in Thailand. It has been used as food for over two t housand years in Asia and several hundred in southern Europe. 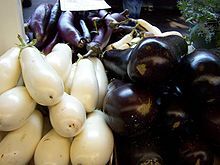 It got the name ‘egg plant' from the very egg-like fruits on some varieties; these are white or creamy and egg-sized and shaped, unlike the fruits on modern egg plant varieties which are usually purple. However, white varieties still exist and varieties with small fruits and even narrow pointed fruits are still grown in some parts of the world. Aubergine is the french name for egg plant, derived from the Arabic name, the Arabs having introduced it to Spain. Aubergine is a very versatile fruit/vegetable, like the related tomato. It is not a juicy fruit and not as versatile as the tomato but it can be used in many ways - in stews or casseroles, baked and grilled. It is a ‘meaty' vegetable that is filling and used for this purpose in vegetarian cookery. It has almost no calories, not much in terms of minerals or vitamins, and its main value is its ability to absorb the flavours of other ingredients. It is an important ingredient of some dishes. It can be a little bitter and some recipes call for salting it before use. Site and soil: Ideally, aubergine is grown in a greenhouse as it benefits from the extra warmth. But it can be grown outdoors in a warm spot. Indoors it is best grown in the open soil rather than in pots or grow bags, and it needs rich, fertile soft soil with lots of well-rotted organic material. ‘Moneymaker' is a well-known purple skinned variety. ‘Balck Enorma' is another. White, egg-sized fruits are carried on ‘Mohican' and ‘Clara'. Some companies offer mixed varieties. The seeds are sown, much like tomato, in late winter or early spring, starting them in a little warmth and growing them on with protection from frost on cold nights. The plants can be sown several to a pot and thinned to one good seedling. It is important to grow on aubergines without a set-back at any stage, potted on as they grow. If they are checked they often flower early and make poor growth afterwards. About five or six fruits per plant is a reasonable target for the large-fruited varieties, more for the smaller ones. Plant out the young plants from pots, usually thirty centimetres or more tall. Generally they have to wait untill mid-May when other plants are put outside and space is created. Allow the plants to grow to about fifty centimetres, pinching out the main growing points if they grow too tall. The plants might need the support of a light stake, especially as the fruits begin to swell. Pick the fruits when they have made good size. Aubergines are very soft plants and attractive for a range of pests, notably greenflies and white flies. It may be necessary to spray with derris to control these.